One of the newest Onion articles has caused waves and sparked criticism from people, including Subway, the company featured in the article. 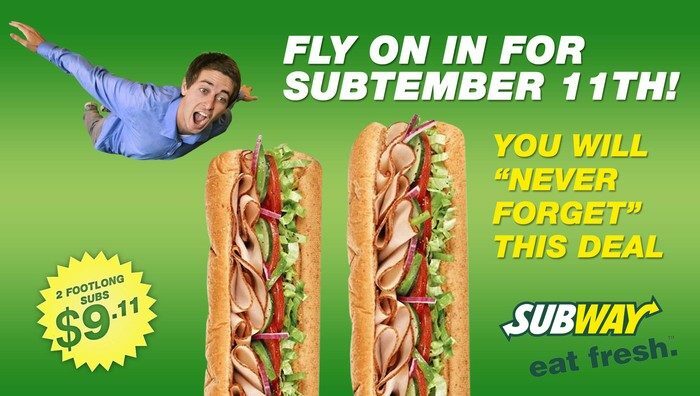 “With a number of terrific discounts on special sandwiches as well as our classic footlongs, you’ll always remember where you were on Subtember 11,” Subway president Fred DeLuca told reporters, the article states. The article is playing off of the ceremonial date of September 11, on which in 2001 the Twin Towers in New York City were struck by planes and almost 3,000 people were killed. Subway responded to the article Friday night, saying it was not pleased with the article. See its reaction and a variety of reactions below.